Situated on Costa Rica’s stunning central Pacific coast and just minutes from the famous beach of Dominical, the Water Villa is a Balinese-style mansion finished to the highest standard of luxury. The four-bedroom and 4.5 bathroom property sleeps up to 8 people and features a combined 12,000 sq. feet of indoor and outdoor space. There are multiple terraces and the infinity pool and spa offer excellent al fresco relaxation. The four master bedroom suites have their own private terrace and feature king sized beds, flat screen TV set, Egyptian cotton bedding, dressing room, closets, coffee maker, refrigerator and safe. 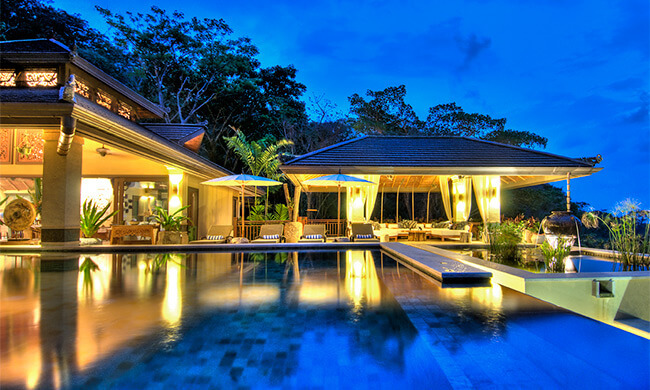 The Villa itself is impressively fitted out to provide every comfort. From the 24/7 on-site staff, daily housekeeping and evening watchman to the individually controlled A/C in every room, satellite TV and Onkyo home theater, guests will find plenty to entertain themselves. Outside there are two showers, a kitchen with BBQ, sink and refrigerator as well as koi ponds an entry pavilion and an ancestor temple.